We recommend marking jobs complete through the Job Signup interface. Nevertheless, there are times you need to enter time worked for jobs that are not in the system, give credit to multiple accounts at once, or reverse an entry. Navigate to Service Hours Admin. Set any desired filters and click Search. To enter time for a single account, click the New link under the Worked column. 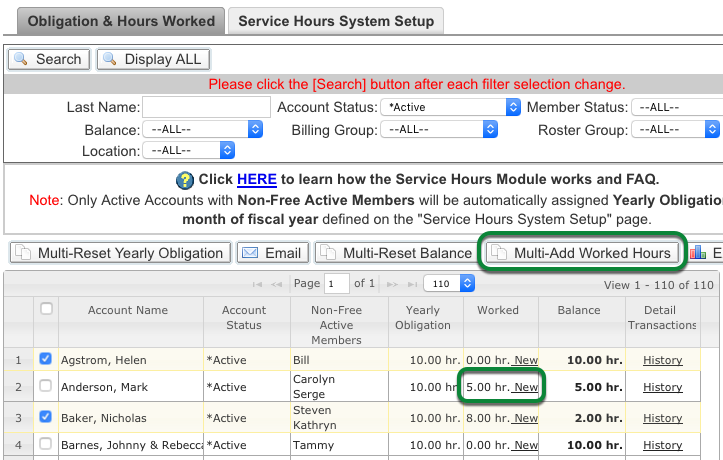 To enter time for multiple accounts, check the boxes by the desired accounts, and then click Multi-Add Worked Hours. Enter either New Service Hours worked, or a negative amount to reverse a prior entry. Add a Message or Memo.